This Sound Activated RGB Controller will easily swap in the place of the standard RGB controller that is included with my Speaker Light Kits. They are custom made with longer, dual output wires as well as a longer remote eye wire than is standard with this controller. 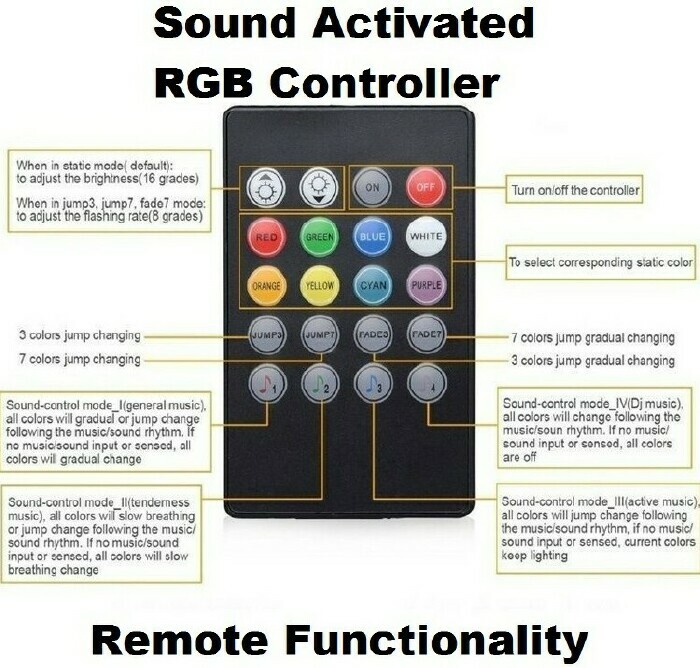 This sound controller comes with a 20 key remote and it's functionality is described below. ...that being said...I am not a fan of these. In a pinball machine the sound activation will be triggered by not only the music, but also the callouts and coil noise. During gameplay there is usually so much sound going on that the sound activation modes generally go nuts to the point that you can't tell they are sound activated at all. I just want to describe these as accurately as I can so buyers are not surprisingly disappointed with them. For $10 you might want to give it a try and if you don't like it you can always hook the standard RGB controller with 44 key remote (that comes with all of my Speaker Light Kits) back up to the speaker lights. The 44 key controller has more transition effects (with adjustable speed), more static colors (with adjustable brightness), more transition effects and also the 6 DIY buttons that can be customized to a color of your making. What I can say about this sound controller is it has more sound modes (4), more static colors, more transition effects and works as well or better than other speaker lights with sound controllers that others are selling for $100 - $130 (yes...seriously). So in summary, I don't care for the sound activated controllers myself, but if you do or want to give them a try, here they are.